THE FIRST TRIAL FLIGHTS of the R 101 were made in 1929. This airship had a capacity of 5,000,000 cubic feet and was originally intended to carry 100 passengers; she was built by the Air Ministry. After a number of alterations the R 101 set out for her maiden voyage, which was to have been to India. Disaster overtook the airship, however, at Beauvais, France, a few hours after the start of the flight on October 5, 1930. THE history of modern airships began in the nineteenth century, when mechanics had advanced sufficiently to enable a motor-driven craft to be built. It was not, however, until 1902 that Colonel S. E. B. Templar, then the head of the Army Ballooning Department, was able to persuade the authorities in Great Britain to allow him to begin the building of an airship. The authorities were so sparing of funds, however, that Colonel Templar was scarcely able to make a start, much less advance. He built two envelopes of goldbeater’s skin each of 50,000 cubic feet capacity, and exhausted all the funds available in doing so. Nothing further was done for five years. Then in 1907 Great Britain’s first complete military airship, the Nulli Secundus, was built. The next airship was ready in May 1909 and was called the Baby. Between then January 1914, when all airships came under the supervision of the Admiralty, the Airship Squadron of the Royal Flying Corps designed, built and flew four more non-rigid airships, each an improvement on her predecessor. In the meantime the Treasury allocated £35,000 for the building of a large rigid airship. A Naval Airship Section was formed under the command of Captain, now Rear-Admiral, Sir Murray F. Sueter, R.N. The firm of Vickers obtained the contract in May 1909. In May 1911 Great Britain’s first rigid airship, the R 1, cynically and unofficially named the Mayfly, was brought out for mooring trials. Experts came to the conclusion that her lift was insufficient for prolonged flights and so, after four days on the mast, she was put back in the shed for adjustment. Unfortunately, when she was brought out again on September 22, 1911, she broke her back and became a total wreck. In January of the following year a conference was held at the Admiralty. It was decided to give up airships and disband the Naval Airship Section. Other countries, however, with longer experience were continuing with airships. Seven months after the Admiralty had abandoned the building of airships the Naval Airship Section was re-formed. It bought a small non-rigid, airship, built by Willows & Co. Two non-rigid airships were bought from Germany and France, a Parseval from Germany and an Astra-Torres from France. The Astra-Torres design is described on page 103. In July 1913 the Navy placed orders for six further non-rigid ships, to be built abroad - three in Germany, on the lines of the Parsevals, and three in Italy, after the style of that country’s Forlanini. Two large rigid airships were also be to built by the Armstrong Whitworth Company. The outbreak of war prevented any of these orders from being carried out. 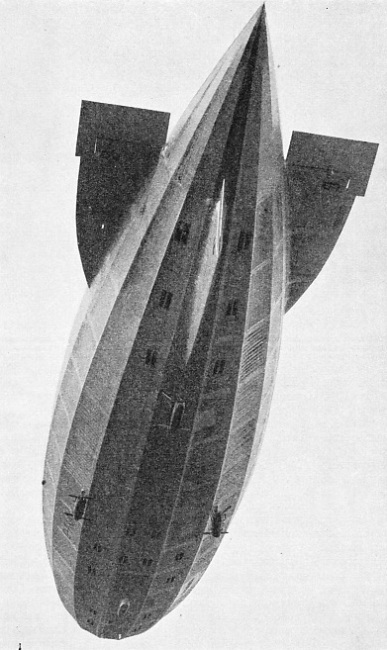 AN ADVANCED TYPE OF SEA SCOUT AIRSHIP produced in 1918. It was known as the Sea Scout Twin because two 75 horse-power Rolls-Royce Hawk engines were fitted. The object of fitting two engines was to reduce the risk of loss due to engine failure. The Sea Scout Twin had a capacity of 100,000 cubic feet and carried a crew of five. THE FIRST DOUBLE CROSSING of the Atlantic was achieved in 1919 by the R34, a sister ship to the R33. These airships were being built at the end of the war of 1914-18. Their design was based on that of the German Zeppelin L33 which was brought down in Essex in 1916 in such a condition that it was possible to adapt the design. When war was declared, Great Britain had seven airships and two airship stations - Farnborough, in Hampshire, and Kingsnorth, in Kent. Kingsnorth was in a half-finished condition. The total personnel consisted of 195 officers and men. At 7.30 p.m. On August 4, 1914, H.M.A. No. 4 (the German Parseval), under the command of Flight Commander J. Fletcher, took off on the first patrol of the war. This was over the Kentish Knock area. On August 9, H.M.A. No. 4 and H.M.A. No. 3 (the French Astra-Torres) instituted regular patrols from Dover to Calais to safeguard the Channel. These patrols were continued and the airships convoyed the British Expeditionary Force across to France. By the end of November 1914 Great Britain’s tiny airship fleet had flown 8,762 miles in war conditions. Early in December the airship Beta went to a station near Dunkirk, France. From there she carried out a series of patrols over the enemy lines, returning to England in the following March. Her place was taken by a specially designed ship with a black envelope for night work. This airship remained in France until 1917. The German submarine blockade of Great Britain was declared on February 4, 1915. On February 28 the late Lord Fisher, then First Sea Lord, sent for Commander E. A. D. Masterman and Wing Commander N. Usborne. He told them that he wanted some small fast airships to operate against submarines, and he wanted them at once. British airship officers were then asked to do in an extremely short time what they themselves had been asking to do for years - produce an airship fleet to patrol British coasts and guard British shipping. The airship officers had to produce a small airship with the material at hand, and so the first Sea Scout (S.S.1) was built. 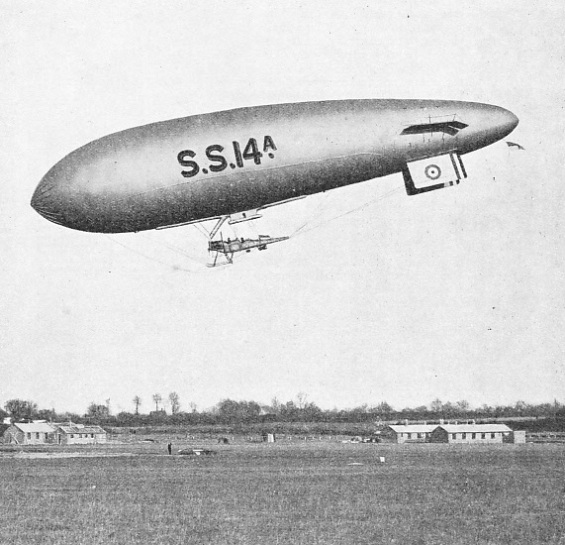 For over two years these S.S. Airships - the “Blimps” - performed a great part of the British anti-submarine patrol and rendered most valuable service to the country. The experiences of pilots and crews were varied in the extreme. When they left on patrol it was with a feeling of uncertainty, as they never knew what was going to happen. Engine failures over the sea were many. When an engine failed, one of the crew had to climb out on the undercarriage and there, standing on a thin skid, locate and rectify faults. Then he would restart the engine by swinging the four-bladed propeller from behind, while with the other hand he held on to a strut of the undercarriage. This frequently happened at a height of 3,000 feet or more over the sea, sometimes in a blinding snowstorm. It was soon realized, however, that a ship of greater size, speed and endurance would be required to meet the ever-growing menace of the submarine. Necessity once again being the mother of invention, an Astra-Torres envelope was taken, and to this was slung a car, consisting of two Avro aeroplane fuselages with the tails cut off and joined together. Thus was evolved an airship with two engines, one at either end of the car. This ship, known as the Coastal, had a gas capacity of 170,000 cubic feet, carried a crew of five and had a speed of 45 miles an hour, with an endurance of eleven hours. With such makeshift material was the battle continued against the enemy submarines and the British climate. Sites for airship stations were selected and sheds and living accommodation hurriedly built. It was now a race between British airship development and the German submarine. In addition to the rigid R 9, the R 23, R 24 and R 25 were laid down. By the end of that year, 1915, twenty-two airships were in commission, personnel had increased to 1,732 and 1,309 patrol hours had been flown. Submarines having appeared in the Mediterranean, squadrons of British airships were sent overseas to assist in the patrol work. One of these was stationed at Kassandra, Greece. Patrols by this squadron became so troublesome and dangerous to the U-boats that repeated attacks by hostile aircraft were made upon the Sea Scout ships. In attempting to combine defence and attack in this area, the airship officers discovered a decoy method of warfare that proved eminently successful. Indeed, it is not too much to say that the tactics displayed during the operations of these Mediterranean airships indicated the methods which the airship will probably follow in a future war. THIS AIRSHIP MADE HISTORY by being the first airship to cross the English Channel. The feat was accomplished in 1910 by E. T. Willows, who built the aircraft. The airship had swivelling airscrews to assist with its control. E. T. Willows’s fourth airship was completed in 1912 and was acquired by the re-formed British Naval Airship Section. An airship would be accompanied on its patrol by a fighting aeroplane. The ship would fly at about 500 to 600 feet, while the accompanying aeroplane would manoeuvre some few thousand feet above with the sun behind it. Before enemy submarines dared venture near the bombing airship, they would communicate with the other wings of their force. This would bring an enemy aeroplane to the attack of the small airship - which was exactly what the decoy ship desired. As the hostile aeroplane unsuspectingly circled over the British airship, the accompanying fighter would dive down and attack the enemy aeroplane. The airship would then continue her patrol, while the two aeroplanes fought out their battle. The element of surprise always being the important factor in warfare, the British aeroplane had the advantage in such encounters. This manoeuvre was hazardous for the airship crew, as there was always the possibility that the enemy aeroplane pilot, before realizing that he was being attacked by a British machine from above, would cripple or destroy the airship. In the main, however, these aerial tactics were successful, so much so that after a time the enemy realized that to send either aeroplanes or submarines into the region round Kassandra was like walking into a trap. I n such engagements, those involved caught a glimpse of what war in the air might mean. It is general nowadays to talk of the next war as a war in the air, but those who theorize about future wars appear to think only in terms of fighting aeroplanes. As early as 1916 there were many episodes which proved the importance of the airship’s part in battles of the air. The airship played many parts in the war, parts of which the general public learned nothing. She could adapt herself to the work of a spy, a patrol, a decoy and a fighter. A FLIGHT TO CANADA AND BACK was successfully carried out in July 1930 by the R 100, seen from below in this illustration. This airship carried a payload as large as that carried by the Hindenburg, built six years later, and was a faster craft. 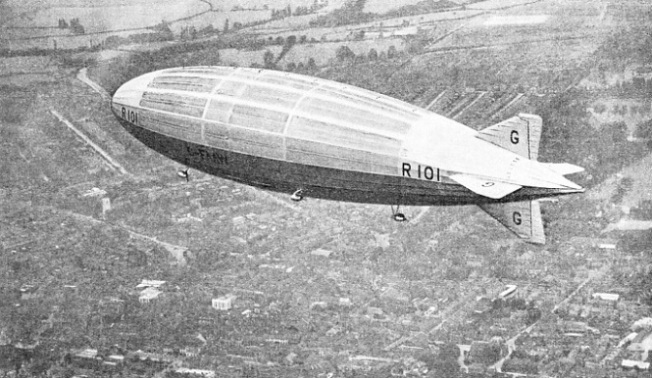 The R 100 was designed at the same time as the R 101 and was approximately the same size. It was the German boast that the British Navy rarely put to sea because of “the efficiency of the Zeppelin patrol”. That may or may not have been true, but there is no doubt that the Zeppelins became a serious problem to the British Navy. British admirals called for a fleet of large rigid airships to drive the Zeppelins from the North Sea and at last such a ship was designed. On paper she was the biggest, fastest and most heavily armed airship the world had yet to see. As there was no shed in the country big enough to accommodate such a ship, it was necessary to build one. Only half the girders for this shed had been erected when the Steel Commission suspended the work. An airship was therefore built to fit an existing shed. Such a ship was too small for the work to be done. She was, therefore, obsolete before she was laid down. By the time this airship was completed, two years later, she was virtually useless. By April 1917 the U-boat appeared to be winning the war and Great Britain was authoritatively said to be within three weeks of defeat. It was at this period that the British Airship Service became fully organized. From the Orkneys to the Strait of Dover, from Dover to a point 100 miles south-west of the Scilly Isles, and thence up the Irish Sea to the west coast of Scotland stretched a complete system of patrol areas over which British airships kept guard. At six o’clock one morning H.M. Airship C 9, under the command of Flight Commander J. G. Struthers, R.N., was some ten miles south of the Lizard, Cornwall, when she sighted the French steamer Rouang. This vessel had been torpedoed at five o’clock and was then being escorted by a trawler. The airship made sweeping circles at full speed, searching the vicinity with great care, as it was felt that the submarine could not have gone far in the time. Nothing was seen for a while. The torpedoed steamer was guarded for about five hours and the air station was signalled that the vessel was capable of being towed. At 10.44 the airship sighted the conning-tower of a submarine in a position fifteen miles south-east of the Lizard. The submarine was some five miles south-east of the torpedoed steamer and on a north-easterly course. Apparently she was attempting to intercept the convoy, which was then on the way to Falmouth. The airship at once altered course down wind towards the enemy, at the same time sending out signals that she had sighted her. As the aircraft approached it was seen that the U-boat was travelling with decks under water and conning-tower awash. At 10.50 two 100-lb bombs were dropped 300 feet in front of the final swirl of the periscope, the submarine having submerged half a minute before. A violent explosion occurred; numerous bubbles and a patch of oil came to the surface. 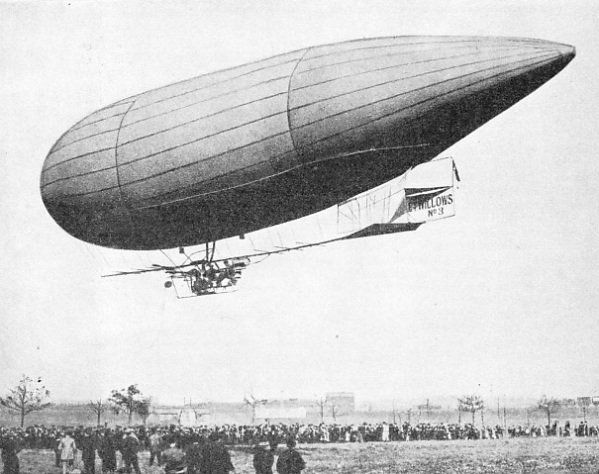 The airships C 2 and C 23 arrived, and at 1.30 p.m. the C 9 left for her base to obtain more petrol and bombs. She returned to the scene at 5 p.m., when a marked increase was observed in the amount of oil on the surface. Watch was kept and at daybreak destroyers using sweeps fouled obstructions on two occasions. The second time there was brought to the surface a piece of steel plate attached to the sweeping wire, but the steel plate fell off before it could be got on board. It was decided that the submarine had been sunk. Flight Commander J. G. Struthers discovered and successfully attacked no fewer than seven submarines. For this work he was awarded the Distinguished Service Cross and two bars. Great Britain was then fighting for her existence, and it became the aim of every pilot and man in the British Airship Service to maintain a ceaseless watch, day and night, over British shipping. Many feats of endurance were performed, but there was none to equal or surpass that of Flight Lieutenant W. E. Bryan, R.N., in the S.S.Z. 39. Small airships of this type carried one pilot, a wireless operator and a mechanic; thus there could be no question of changing over to a relief pilot while in the air. Yet during the summer of 1918 Flight Lieutenant Bryan, in this small ship, operating from Polegate, Sussex, carried out a patrol over the English Channel of fifty hours fifty-five minutes duration. The pilot landed with one gallon of petrol in his tanks. At other stations round the British coasts, pilots flying this same type of ship frequently patrolled for twenty-six and thirty hours. These were not “stunt” flights. Germany had then 140 submarines operating against British and Allied shipping. At the end of a normal patrol period there was not always a relief airship available, and so the pilot had to remain until one arrived or his fuel was almost expended. British airships were not only able to sight submarines, but, using hydrophone gear, were also able to listen for and detect the raider while he remained invisible to the eye. This is a feat impossible to the heavier-than-air machine and makes this type of craft useless for anti-submarine patrol and coastal reconnaissance during the hours of darkness. On the other hand, the airship gives an efficient patrol of twenty-four hours. Other duties of the airship comprised escorting convoys, searching for and destroying floating mines, finding the survivors of torpedoed, vessels, and frequently going to the rescue of heavier-than-air machines down on the water. With the airship patrol steadily increasing its activities and range, enemy submarines were driven farther and farther from the British coast, until eventually they were operating 600 miles west of Ireland. During the period from April 1917 to May 1918, the decline in sinkings was from 700,000 to 160,000 tons a month. PATROLS OVER ENEMY LINES were carried out in 1914-15 by the British airship Beta, which was stationed near Dunkirk, France, for several months. She afterwards returned to England and her place was taken by a specially designed airship, with a black envelope for night work. The Beta was constructed from a smaller airship, the Baby, in 1910, and was the first airship to carry wireless equipment. When the Armistice was signed Great Britain had 103 airships, chiefly of the non-rigid type. During the four years of warfare they patrolled 2,042,320 miles in 84,807 hours and the total casualty list, due to enemy action and accident, amounted to only forty-eight officers and men - an average of 42,548 miles per casualty. From January 1 to November 11, 1918, there were only nine days in which British airships did not fly because of bad weather. In eighteen months British airships escorted over 2,000 convoys, sighted 134 mines, destroying seventy-three, and successfully attacked twenty-seven submarines out of forty-nine sighted. Mr. Lloyd George has written, “The greatest Allied triumph of 1917 was the gradual beating off of the submarine attack. This was the real decision of the war, for the sea front turned out to be the decisive flank in the gigantic battlefield. Here victory rested with the Allies, or rather with Great Britain.” The defeat of the U-boat was the defeat of Germany, and in that defeat British airships both at home and abroad played no small part. British airship designers, with this war achievement behind them, turned their attention to the development of transoceanic commercial flying. In July 1919 the R 34, a copy of the German L 33 (1916), made the first double crossing of the North Atlantic. Nine years were to pass before another aircraft, the Graf Zeppelin, was to make this double flight, and so in this field British airships had almost a decade’s start of all other countries. At this period, however, the Air Ministry had taken full control of airships and a systematic disbandment set in. The R 38, then under construction, was sold to America. The intention was to fly her to that country, and a crew arrived in England for that purpose. This ship was originally intended for war service in the North Sea. Lightly constructed, she had an exceptionally high ceiling of 25,000 feet, to avoid hostile aircraft. She was built to the limitations of the shed at Cardington, Bedfordshire, and this restriction greatly handicapped her designers. In addition, certain new features were introduced. While undergoing trials at a low altitude over the River Humber, the ship’s structure suddenly gave way and she broke in two. The British Airship Service had suffered its first major accident. The two Zeppelins L 64 and L 71, surrendered to Great Britain in accordance with the Armistice terms, made no flying records after arrival in Great Britain. A remnant of the Airship Service survived and in 1924 the Government announced that it would initiate a comprehensive programme of airship services. The Airship Guarantee Company was given a contract to build a commercial airship and the Air Ministry was to build another ship and overseas bases. 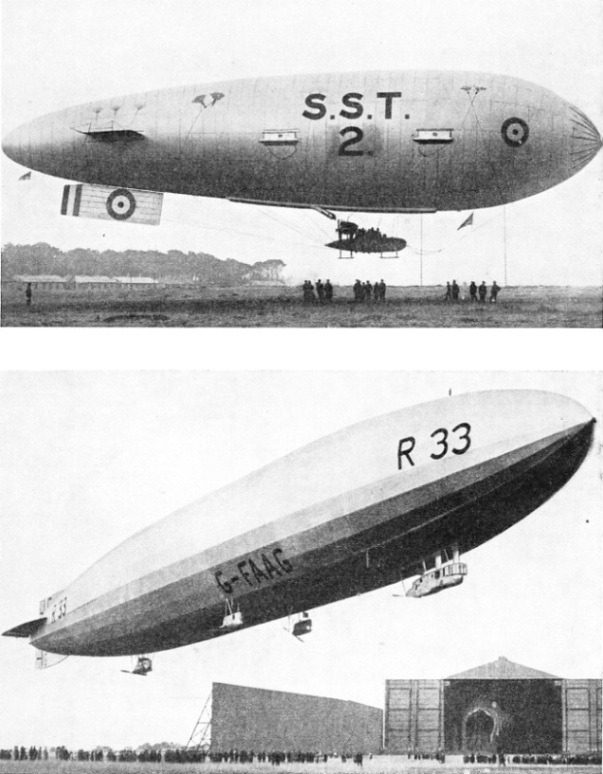 These airships were the R 100, built by the company, and the R 101, built by the Air Ministry. Both ships were to have a capacity of over 5,000,000 cubic feet. There was to be accommodation in each ship for 100 passengers. Over four years were spent on their design and construction, and the first ship to be ready was the R 101. From the first this ship was a failure. An airship, unlike a heavier-than-air machine, is launched and becomes airborne for the first time inside the shed in which she has been built. The load of fuel, ballast and so forth which she has been designed to carry are put on board, all other outside weights are taken off and the mooring ropes are gently eased up. The airship should then slowly rise from the ground, but this movement is at once checked to prevent her from striking the roof of the shed, This test, however, has been enough to show that she will do that for which she has been built. The R 101 failed to rise and proved to be no less than 25 tons too heavy. Numbers of passenger cabins and various fittings had to be removed before she became airborne. In October 1929 she did her first trial flight. The R100, built by the Airship Guarantee Company, had completed her trials and in July 1930 successfully flew to Canada and back. British airship people can, with pride, point to this feat, for the R 100 carried a payload equal to that of the Hindenburg, built six years later, and was a faster craft. For reasons of policy, however, the R 100 was scrapped in 1931. AN AEROPLANE FUSELAGE served as the car on the early Sea Scout type of airship used in 1915 for submarine spotting. Engines were not particularly reliable in those days and observers often had to climb out on the undercarriage, repair a defect and restart the engine by swinging the propeller with one hand while holding on with the other. You can read more about “Airships” on this website. You can read more about the “Hindenburg” in Wonders of World Engineering.